. . .to celebrate God’s presence, to live with respect in Creation . . . 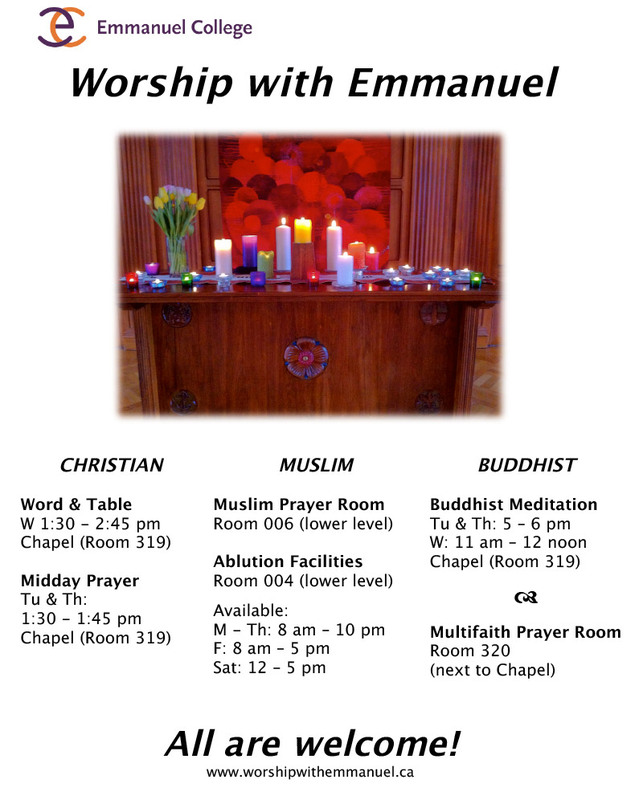 The worship life at Emmanuel has two main related purposes, to gather the Emmanuel College community together for the public worship of and witness to God, and to provide a supportive environment for students to learn about and practice different forms of worship leadership, including engagement with the College’s increasingly intercultural and interfaith context. The Interim Director of Chapel, Faculty Advisor and Director of Music will frequently follow up with worship leaders after their leadership for conversation and reflection to discuss strengths, challenges, and areas for continued improvement and learning. Would you like to be a part of the worship team for the 2019/2020 school year? Download the application and return it to Dr. Becca Whitla b.whitla@mail.utoronto.ca by April 30th. We invite all members of the Emmanuel community to share any comments and suggestions with any members of the Worship Team by email, in person or as comments on this website.